Photoshop Elements 7 offers a variety of tools to help make photo editing easy. Knowing the elements of the workspace gets you going, and when you add toolbox shortcuts and a range of tricks to help select images, editing photos becomes a snap. Access panels as needed by choosing them from the Window menu or the Panels Bin. 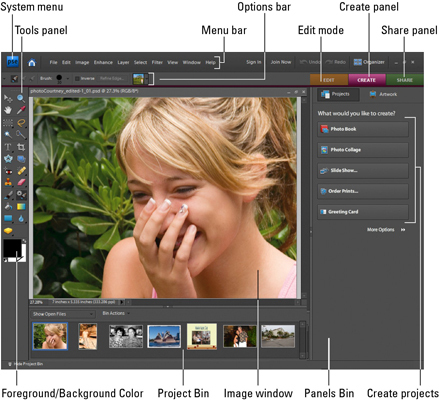 Photoshop Elements provides you with numerous keyboard shortcuts to edit, alter, and generally play with your pictures. 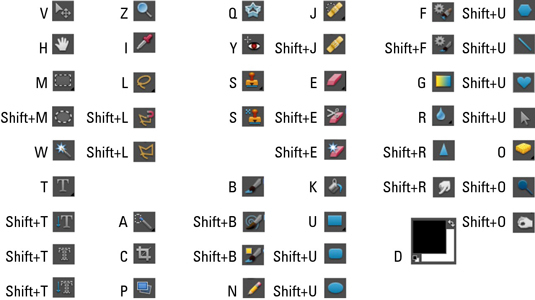 Explore these shortcuts and perhaps find some features in Elements you didn’t know about! Returning to the last tool used requires pressing the Shift key and then the keystroke. For example, if the Elliptical Marquee was the last tool used, press Shift+M to return to the Marquee tool.